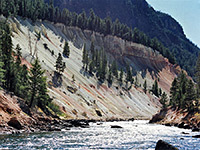 The east of Yellowstone National Park is a varied region including Yellowstone Lake, the Yellowstone River and its Grand Canyon, scattered thermal areas, high mountain peaks, thick pine forest, and broad valleys filled with wildlife. The Canyon and Lake areas have plenty of short, easy day hikes and there are many miles of little-traveled backcountry trails further east, centered on Pelican Valley and Lamar Valley. The Yellowstone hiking map indicates the location of each trail. 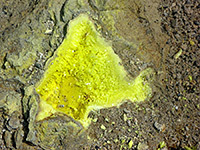 All paths in Yellowstone: North, East, Southeast, Southwest, West. Cascade Creek 1.5 40 Beginning less than half a mile west of Canyon Junction, on the road to Norris, the Cascade Creek trail follows beside the stream up a shallow valley to a junction with the Cascade Lake Trail; the lake is one mile further west. Moose, elk and bears are often spotted along the creek. Cascade Lake 2.25 80 This easy half day hike descends into the valley of Cascade Creek, through meadows and across several small streams then along the main creek westwards to Cascade Lake, from where other trails continue further west, including the ascent up Observation Peak. The trailhead is at a picnic area 1.5 miles north of Canyon Junction. Clear Lake 1 150 Clear Lake is a large, bubbling pool in the mountains a short distance from the South Rim Drive along the Grand Canyon. The easiest trail to the lake starts from the main parking area on the south rim and climbs gently across a partially wooded plateau to the south shore of the lake. Other linked trails head east towards Lily Pond & Ribbon lakes, or west towards the Yellowstone River - the walk to Clear Lake is often combined with a trip to Ribbon Lake to form a loop, of between 3 and 6 miles depending on the choice of route. Grebe Lake 3 40 One of several short routes beneath Observation Peak, this crosses the Solfatara Plateau to the south shore of Grebe Lake, and on to an intersection with the Howard Eaton Trail which in turn leads to the Cascade Lake Trail (and, westwards, to Wolf Lake - see hikes in the west). All of the path to Grebe Lake is through a wooded region heavily burned in 1988, passing over small streams and near to many fumaroles emitting sulphurous gases. The lake itself is not particularly impressive or scenic. Lower Falls 0.75 600 The steep but very popular path to the brink of the lower falls of the Yellowstone River begins from the southernmost parking area along the one-way North Rim Drive. It switchbacks down the wooded canyon walls to a fenced viewpoint right beside the fast-flowing river. Mount Washburn 2.25/3 1,500/ 1,600 Three routes climb to the summit of Mount Washburn, a 10,243 foot peak north of the Canyon area and the site of the main fire lookout point in the national park. The shortest (2.25 miles) begins at the end of a gravel track (Chittenden Road) forking off the main road from Norris to Canyon Junction, and ascends a ridge on the north side of the peak. The other short option (3 miles) leaves the road by its highpoint at Dunraven Pass and switchbacks up the steeper south face of the mountain. 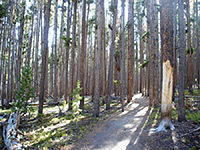 The third route begins 3 miles along the Seven Mile Hole Trail, where a 5.5 mile spur path branches northwards, crossing woodland, meadows and the Washburn Hot Springs thermal area before climbing the east side of Mount Washburn. Views from the top extend south to the Grand Teton range on a clear day. Other attractions are spectacular displays of wildflowers in early summer, and the chance to see bighorn sheep. North Rim 3 200 The Grand Canyon of the Yellowstone River north rim route follows close to the canyon edge from the road bridge above the Upper Falls to Inspiration Point in the east, providing additional viewpoints to those accessible from the road. Some parts are paved and level though the easternmost section is rather steeper. Observation Peak 3 1,400 The route to the top of 9,397 foot Observation Peak starts at Cascade Lake, 2.25 miles west of the main road near Canyon Junction; it switchbacks up steep slopes then follows a more open ridge to the summit, passing through forests of whitebark pine mixed with grassy meadows. From the top stretches a 360° view of the north Yellowstone wilderness, over Norris Basin, the Grand Canyon, Hayden Valley and towards even higher peaks in the Washburn Range to the north. Ribbon Lake 2 120 Ribbon is one of a small group of lakes on the south rim of Yellowstone's Grand Canyon, and reached by several routes; the shortest begins at the end of the rim road at Artist Point, following the South Rim Trail for a while then branching off to the south, and later bending back east. A spur path continues 1/4 mile past the lake to the top of Silver Cord Cascade, while an alternative return is via the hot pools and mudpots of Forest Springs. Seven Mile Hole 5.5 1,400 One of the best hikes in all of Yellowstone, this route winds through dense pine forest, past active and inactive thermal areas, then descends to the edge of the Yellowstone River, deep within its Grand Canyon. overall The partially paved path along the south rim of the Grand Canyon starts at the road bridge over the Yellowstone River and passes numerous viewpoints of the Upper Falls, the Lower Falls and the canyon. The first 2 miles parallels the road and is quite busy in places, but not many people walk the final mile to Point Sublime. Uncle Tom's 0.25 500 The famous Uncle Tom's Trail descends very steeply to the foot of Lower Yellowstone Falls via raised metal walkways and over 300 steps. It begins a short distance along the South Rim Trail, from the main parking area on the south rim drive. Sour Creek 1.5 level Sour Creek is a connecting trail linking Wapiti Lake Trail, near Clear Lake on the south rim of the Grand Canyon of the Yellowstone River, with the Howard Eaton Trail that follows the river south towards Yellowstone Lake. The path crosses open meadowland around Sour Creek and other smaller streams, past a few steam vents and hot pools. Wrangler Lake 2.5 200 Remote Wrangler Lake is reached by a path branching off the Sour Creek route - this follows the creek further into the mountains then climbs a hillside to the lake and several smaller pools. The distance from the initial trailhead along the main road is 4.5 miles. Avalanche Peak 2.5 2,120 The unmarked but well maintained path to Avalanche Peak, one of several mountains along the eastern park boundary, starts just west of Eleanor Lake along the East Entrance Road, and climbs steadily through forest to bare rock and scree slopes around the summit. Crater Hills 1 200 There is no trail to the Crater Hills, location of a fascinating and colorful collection of hot springs and sulphurous vents, but this backcountry thermal area near Hayden Valley can be visited by an easy hike across bison-frequented grasslands. Elephant Back Mountain 3.6 (loop) 800 Elephant Back Mountain is a straight, flat-topped, steep-sided peak overlooking the northwest corner of Yellowstone Lake. Starting at Lake Village, a loop trail climbs the east corner, follows the rim for a short distance then descends by an alternative route, giving excellent views over the lake and surrounding mountains, though most of the route is densely forested. 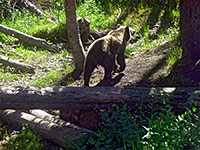 Grizzly bear activity sometimes causes the trail to be temporarily closed. Natural Bridge 1.25 100 The small natural rhyolite bridge along Bridge Creek, on the west side of Yellowstone Lake, was discovered in 1871 and used to be accessible by car, but the narrow road leading to it has recently been closed to vehicular travel so approach is by foot or bicycle only. Alternative access is from Bridge Bay campsite, from where a 1 mile path crosses woodland and joins the road about half way along. Pelican Creek 1 (loop) level At the mouth of Pelican Creek, this easy path loops through marshes and woodland south of the park road to the shore of Yellowstone Lake. The trailhead is a mile east of Fishing Bridge. The beaches of this part of the lake are a good place for bird watching and for photographing the sunset. Storm Point 2.3 (loop) level A longer version of the Pelican Creek Trail, this loop passes through lodgepole pine woodland and meadows to the shores of Yellowstone Lake, starting at Indian Pond/Squaw Lake next to the main road. Bison are often seen in the open land along the lakeside, with bears and elk also common at some times of year. Turbid Lake 5.5 500 Turbid is a shallow, acidic, effervescent lake adjacent to a small region of hot springs. A trail runs past the west side starting, in the north, 3 miles along the Pelican Valley Trail, and in the south, from the East Entrance Road just as it bends away from Yellowstone Lake. The southern end passes over the slopes of Lake Butte, climbing then descending 500 feet but the rest of the route is mostly level. Frost Lake 4.5 2,550 The steep path to Frost Lake from the upper end of the Lamar River valley is one of the least used trails in Yellowstone. From the lake, on the eastern park boundary, TR 751.2D descends into the canyon of the North Fork of the Shoshone River and eventually back to the highway. (Lake to Canyon) 120 The longest path in Yellowstone, the Howard Eaton Trail follows a similar route to the Grand Loop road, linking Mammoth Hot Springs, Tower, Norris, Canyon, Lake and West Thumb, though the majority is no longer maintained. One of the two most used parts is from Lake northwards along the Yellowstone River, over meadows and through woodland, eventually meeting the road again at Canyon next to the start of the South Rim Drive. Most people just walk a few miles up the southern end, as far as an overlook of Le Hardys Rapids. Lamar River 20 800 Along with Hayden Valley, the Lamar River is the best place to see wildlife in Yellowstone National Park, and receives fewer visitors. The lower part is wide, meandering and close to the park road but the upper section is accessible only by a long trail heading deep into the wilderness; this is sometimes marshy, and steepish near the southern end but generally quite easy. The trailhead is next to Soda Butte Creek, 13 miles east of Tower Junction, while the far end is at a patrol station high in the Absaroka Mountains. Mist Creek 14 1,200 Mist Creek Trail links Pelican Creek with the upper Lamar River. The west end is 3 miles along the Pelican Valley Trail, from where the route forks off to the northeast over open meadows by the creek, past Pelican Springs and up a tributary ravine to Mist Creek Pass at 8,600 feet. Beyond here is a steady descent along Mist Creek, ending at a junction with the Lamar River & Frost Lake trails. Pelican Cone 4 1,680 Starting 6 miles along the Pelican Valley Trail, the path to the summit of Pelican Cone climbs steadily though not too steeply, up the wooded, south facing slopes of the peak. At the top is a lookout point, and far reaching views over Yellowstone Lake and surrounding mountain ranges. Pelican Valley 12 500 The lower few miles of the valley of Pelican Creek are very wide, flat and grassy - perfect wildlife conditions, and all the large mammals of Yellowstone may be found here, including wolves. The upper section is rather narrower, winding northwards between hills of increasing height, through several groups of hot springs and pools. Pelican Valley Trail begins at the end of a short side road branching off the highway at the north end of Yellowstone Lake, cuts across a low ridge and follows beside the creek for most of its 12 miles, past several junctions with other backcountry trails. Bear activity sometimes causes the trail to be closed, and when open it is recommended hikers travel in groups of 4 or more. Tern Lake 6 350 Also known as Astringent Creek Trail, this path parallels much of the Pelican Valley Trail, running about a mile to the west along the course of two creeks (Astringent and Broad), to White Lake, Tern Lake and nearby Fern Lake, where 3 continuation trails branch off to the west, north and east. The west branch links with the Wapiti Lake Trail after passing through an extensive thermal area (Ponuntpa Springs). 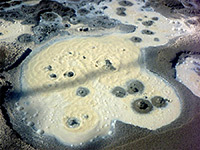 The upper end of Astringent Creek also has pools and mudpots, part of a large, newly developing active area. Wapiti Lake 16 1,250 The trail to Wapiti Lake is an interesting route giving access to various backcountry thermal areas. The first (Forest Springs) is just a mile from the trailhead (at the start of the South Rim Drive along the Grand Canyon of the Yellowstone River) - various groups of hot pools at the north edge of Sour Creek Valley. From here the path climbs through woodland and across a wide plateau for several miles, before a steep descent into the valley of Broad Creek. The final section is up a side ravine opposite to Wapiti Lake then back south over more open land where it meets the upper end of the Pelican Valley Trail. Hiking off trail down the lengthy drainages of Broad Creek or Shallow Creek (which flows northwards from Wapiti Lake) leads to many little known active regions, some not marked on any map.